Department of Chemistry and Science Club of D B Pampa College observed the World Environment day on 06.06.2018. this year Focal theme was “Beat Plastic Pollution”. 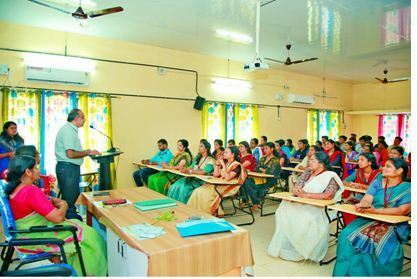 The event was conducted with the support of Kerala State Council for Science, Technology and Environment (KSCSTE). The program was inaugurated by Dr. G. Nagendra Prabhu, Associate Professor P. G. Dept. of Zoology & Research Centre S. D. College, Alappuzha. Presidential address was given by Dr. S Joy, Principal D.B Pampa College, Parumala. Head of the Chemistry department, Dr. P Geetha delivered the welcome speech, Felicitations of the program was given by Prof. Arun.R, (IQAC Co-coordinator, and HOD, Dept. of English), Dr. Sreekala (HOD, Dept. of Zoology) and Dr. JaimshaRani(HOD, Dep. of Botany). Vote of thanks was given by Dr. Ramya Jayan.S, Programme Coordinator. Chief guest Dr. G. Nagendra Prabhu made a presentation on the topic ”Eco-Friendly Alternatives to Plastics from Aquatic Weeds”. Various competitions were held for students. The Principal of D B Pampa College; Dr. S Joy distributed the prizes and certificates for winners. The program ends up with National Anthem.